When do the civil litigation transaction levy changes adopted under the 2018 program apply? In our September 28, 2017 LAWPRO ‘2018 Program’ media release and October, 2017 issue of the LAWPRO Magazine, we advised that the civil litigation transaction levy amount would be increased from $50 to $100 per transaction under the 2018 program and that the levy would no longer be payable in respect of proceedings that entirely pertain to family law issues. In accordance with Endorsement No. 3 “Civil Litigation Transaction Levy Surcharge” of the program POLICY (LAWPRO policy no. 2018-001), the levy applies to civil litigation transactions in which files are opened on or after January 1, 2018 (see section D(ii) of the Endorsement). For a levy to be payable, the definition of “civil litigation transaction” must first be met (see section A of the Endorsement). So, for example, if no proceeding has been commenced, no civil litigation transaction levy would yet be payable in respect of that file. Even if a civil litigation transaction file was opened on or after January 1, 2018 and the definition of “civil litigation transaction” is met, no civil litigation transaction levy is payable in respect of excluded transactions. Given the introduction of a new exclusion for 2018, for transactions where the proceedings entirely pertain to family law issues, no civil litigation transaction levy will be payable (see section C(iv) of the endorsement). If I opened a civil litigation transaction file in 2017 and no proceeding was commenced until 2018, what transaction levy amount would apply? 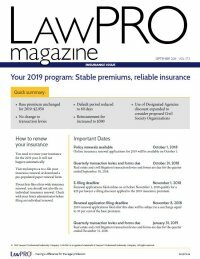 The 2017 program POLICY (LAWPRO policy no. 2017-001) would apply, since the file was opened in that year. In accordance with Endorsement No. 3 of that POLICY, a transaction levy amount of $50 would apply. If I opened a civil litigation transaction file in 2018 and no proceeding has yet been commenced, is a transaction levy payable in respect of the file? No. Although the 2018 program POLICY would apply (since the transaction levy file was opened in 2018), no “civil litigation transaction” has yet occurred, so no civil litigation transaction levy is yet payable in respect of the file. In 2018, I opened a civil litigation transaction file and commenced proceedings pertaining entirely to family law issues, is a transaction levy payable in respect of the file? No. Although the 2018 program POLICY would apply (since the transaction levy file was opened in 2018) and a “civil litigation transaction” has occurred, no civil litigation transaction levy would be payable since the transaction relates to proceedings that entirely pertain to family law issues so Exclusion C(iv) would apply. Who is required to pay the civil litigation transaction levy charge? If a LAWYER or LAW FIRM acts for one or more parties in a civil litigation transaction (as defined in paragraph A of Endorsement No. 3 of the POLICY) the LAWYER is required to pay the civil litigation transaction levy surcharge. Who is required to pay the real estate transaction levy surcharge? If a LAWYER or LAW FIRM acts for one or more parties in real estate transaction (as defined in paragraph A of Endorsement No. 2 of the POLICY) the LAWYER is required to pay the civil litigation transaction levy surcharge. How is the civil litigation transaction levy calculated? How is the real estate transaction levy calculated? Can the levy surcharge be billed to clients? I want to know if a transaction levy is applicable to a particular situation that is not covered explicitly in Endorsement No. 2 or 3 of the primary LSO program POLICY. How can I find out if a levy applies? You can refer to the online real estate and civil litigation transaction levy application chart (available at My LAWPRO) or you can contact Customer Service. I have opted for the Restricted Area of Practice option and intend to practise only criminal law. Am I not automatically exempt from having to remit real estate and civil litigation transaction surcharge filings? No. All LAWYERS in private practice, regardless of their area of practice or the practice option(s) selected, are required to file either an annual transaction levy exemption form (which exempts them from filing quarterly transaction levy forms) or a quarterly transaction levy filing form indicating total transactions and surcharges payable for that quarter. The exemption form must usually be filed by April 30 each year. What documentation must be submitted to LAWPRO for the levy surcharge? You must complete and remit to LAWPRO the civil litigation and or real estate transaction summary form(s) for levy surcharges along with the quarterly payments (if applicable). LAWYERS and LAW FIRMS must list, on the transaction summary form or on an accompanying attachment, the names of all LAWYERS whose transactions are included on the form. Who may file documentation on a member’s behalf? LAWYERS may delegate to their firms the responsibility of completing and remitting to LAWPRO the civil litigation and or real estate transaction summary form(s) along with the quarterly payments. However, it remains the responsibility of the individual LAWYER to ensure that the surcharge forms are submitted accurately and on time to LAWPRO. When are levy surcharge payments due? The transaction levies must be accumulated and paid quarterly within thirty days of the quarterly period ending on the last day of March, June, September and December. Can I file the required levy forms online? Yes, transaction levy forms can be filed online at My LAWPRO. When do I have to file an exemption form? LAWYERS who are exempt from paying the transaction levy surcharge must file the exemption form once every year, by April 30th. LAWYERS admitted into practice after that date should file the exemption form within 30 days of the next quarterly period ending on the last day of June, September or December. My understanding is that title-insured real estate transactions are exempt from the $65 real estate transaction surcharge. If I am acting for the vendor in the transaction, do I have to pay the $65 or am I also exempt? The counsel for the vendor is not exempt from having to pay the $65 real estate transaction levy surcharge as the title policy does not insure the vendor but rather the purchaser and the legal services provided by the solicitor. The vendor’s LAWYER continues to be exposed to risk of a CLAIM, and therefore must pay the $65 transaction surcharge. LAWYERS for the purchaser should bear in mind that not all title-insured transactions are exempt from the $65 real estate levy. For details please refer to your LAWPRO Policy Endorsement 2 Real Estate Transaction Levy Surcharge. Does the real estate transaction surcharge apply to transactions where a title policy is issued? the LAWYER(S) is(are) not obliged to pay any DEDUCTIBLE amount to the title insurer(s) in respect of one or more claims made under the title insurance policy(ies) where the DEDUCTIBLE amount is or may be the subject of recovery under the POLICY. On its website, the Law Society lists those title insurers who have entered into such a release and indemnity agreement in a form satisfactory to the Law Society. LAWYERS and LAW FIRMS should be certain to ensure that a title insurance policy(ies) for the transaction is(are) actually issued after filing a title insurance application. Where no title insurance policy(ies) is(are) issued, a real estate transaction levy surcharge shall apply. Are family law cases considered civil litigation for the purpose of transaction levies? Family law matters make up a significant proportion of lawyer files in Ontario each year. LAWPRO analysis of claims trends has shown that, from a professional indemnity perspective, family law litigation is significantly less risky than other kinds of litigation. In response to this observation, beginning in the 2018 policy year, lawyers who initiate family law proceedings will no longer be required to pay civil litigation transaction levies.